I would really like to write a great review for this book as I really enjoyed it. However I don't seem to have the writing talent that Elliott Light has, so I will just say a few things.I liked the way the murder investigation is intertwined with the pseudo science of Eugenics. Light seems to be good at this sort of thing. Plus it has lots of cats which is a real winner for me. Shep Harrington is back in the third installment of Elliott Light’s novels, this time Shep takes a stab at the world of eugenics, which is breeding to create the ultimate human, a person with the most desirable qualities, created in a lab. 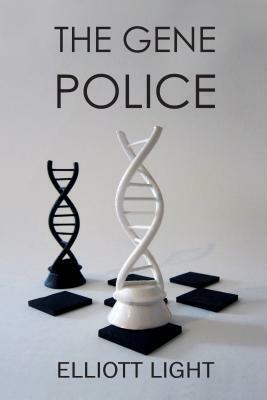 In The Gene Police, we are taken back in time where we meet Carl and Betty who are sterilized after the death of their newborn baby.When, fifty years later, the DNA of that dead baby is found at a murder scene, things get a little tricky. Was that baby actually dead, and why were Carl and Betty sterilized? With the help of Betty’s nephew, the answers may not be as far away as they once thought. Shep is the one who can find the answers, if anyone can.Elliott Light has a way of creating characters that pop off the pages, and this book will have you immersed from the very first page. Shep is a kind hearted character, he’s seen a lot of stuff in his life, and there is never a dull moment with him. This is one of those books that has quite a few different plot lines, but they all come together in the end.This book was what first made me want to read the Shep Harrington Small Town Mystery series, it sounded so incredible to me, something that I haven’t read before, at least that comes to mind. Not only is the science of eugenics part of this novel, but throw in a murder mystery, and you’ve got a suspenseful, engrossing tale. I give this book 5 out of 5 stars, definitely a keeper here! I received this book from the author in exchange for an honest review. ElliottLight - I am a retired patent attorney living in Florida with my wife Sonya and our feline, Tsuki. I spent most of my life in the Washington, D.C. area. I grew up in McLean, Virginia before the beltway was constructed. Some of my classmates in grade school lived on nearby farms. ​McLean had a small town feel to it. Gossip spread without the Internet. Party lines were common. Secrets were hard to keep.​When I was in my early thirties, my life pivoted when I was accused of a crime I didn't commit. My defense counsel and I discussed plans for my likely indictment and possible imprisonment. I could expect to be handcuffed and paraded in front of the media. This experience with the so-called justice system ended after a two year ordeal when I was cleared of wrongdoing. No indictment. No trial. Even so, it could have ended differently. Sadly, I will never fully believe that prosecutors, investigators, or the government are as interested in the truth as they are in getting a conviction, an attitude that I share with the semi-fictional Shep Harrington. The Shep Harrington SmallTown® Mystery series began with the publication of ​Lonesome Song in 2002. Before writing Lonesome Song, I was intent on writing action-spy stories. In 1990, I read "The Last Poorhouse In Virginia; An Era's End at the Place Where No One Was Meant to Stay," a story article written by Jim Naughton and published in the Washington Post. The story chronicled the lives of the residents of what had been a poor farm, a place where the unemployed and unemployable were sent to trade work for food. As I chased dreams of writing the next Clancy thriller, the story of the last remaining residents of the Shenandoah County facility continued to haunt me.​I grew up visiting old plantations where my mother's relatives once lived. As a child, I didn't fully appreciate the history of these places or the people I met there. But the experiences were imprinted on my memory. The poor farm in Mr. Naughton's article fused with these memories. I was teased by questions about who might have lived on a poor farm, how they might have arrived there and what was going to happen to them. Ultimately, spies gave way to a story about a small town, a once famous country singer, a collection of old forgotten poor farm residents, and a murder. Shep Harrington, a young disbarred attorney, entered the mix and the story almost wrote itself.​While I work hard to reveal how bad people do bad things, the core cast of the SmallTown® Mystery series works equally hard to remind me of their good intentions and natural humor. I hope you will visit with them soon.